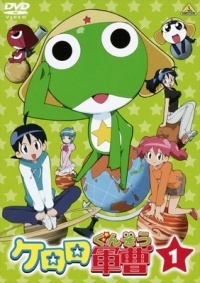 Keroro Gunso (also known as SGT Frog in English) is a manga and anime series by Mine Yoshizaki. The manga began in 1999 and is still ongoing with over 23 volumes. The anime adaptation ran from 2004 to 2011 and had 358 episodes. Keroro takes a Bubble Bath in the Sink while doing dishes. Later on at 18:42, Natsumi Hinata takes a Bath in a Unit Bathtub and is recorded by Keroro. She notices this happening and throws a Bath Bucket out the window but then doesn't see him out the window. Natsumi Hinata takes a Bath in a Unit Bathtub and cleans it at the same time. Keroro breaks through the window and tells her she isn't cleaning it correctly but she gets mad because he broke the window and sends him flying back out of it. Keroro takes a Bubble Bath in the Sink while doing dishes. Later on, Natsumi Hinata takes a Shower in a Shower Stall. This page was last modified on 7 October 2018, at 17:14.